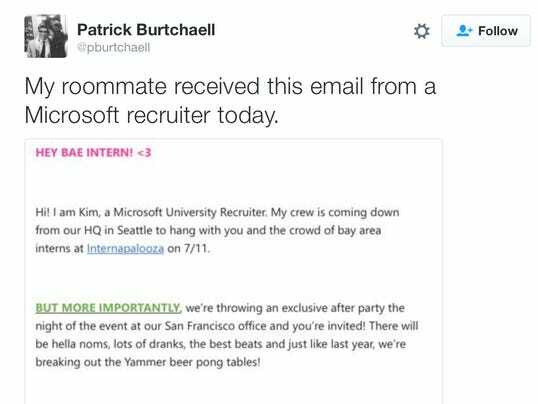 A Microsoft recruiter used cringe-worthy slang to invite a college student to what sounds like a beer pong party earlier this week. Part of the email was posted on Twitter by Patrick Burtchaell, a Loyola University New OrleansÂ student who said it was sent to his roommate. Thatâs exactly what Microsoft recruiter âKimâ sent in the email. And, it gets worse. Yes, sheâs coming whether you like it or not. Did Regina Georgeâs mom write this? Also, do Yammer beer pong tables really exist? The end of the email is in all caps, bright orange and implies Microsoft is trying to get college kids drunk. Hopefully, Kim doesn’tÂ know what âgetting litâ means. This isnât the first time Microsoft missed the mark trying to connect with Millennials. In March, the company apologized for Tay.ai, a chatbot that started saying racist and offensive comments.Â The same month, Microsoft apologized for featuring dancers dressed as scantily-clad schoolgirls at an Xbox party.